As a Staples High School junior, Dylan Mace went the extra mile. Or three. Appalled that Westport’s VFW Post 399 lacked a handicap-accesssible bathroom, he singlehandedly raised almost $8,000. An architect, electrician, contractor and tile guy jumped in. Businesses offered discounts on supplies. They were joined by Scott Rochlin, who set up a foundation to help veterans and their families after his son Charley — a decorated Marine — died in an automobile accident. But Dylan wanted his project to be extra-special for veterans. He created special tiles, with the emblems of the 5 US military branches. Dylan loved working — and hanging — with the VFW crew so much, that he vowed to do even more. The new bathroom looked great, he thought — so why not spruce up the rest of the building too? He enlisted 12 fellow National Honor Society members to help paint. They other day they grabbed brushes and rollers, and got to work. 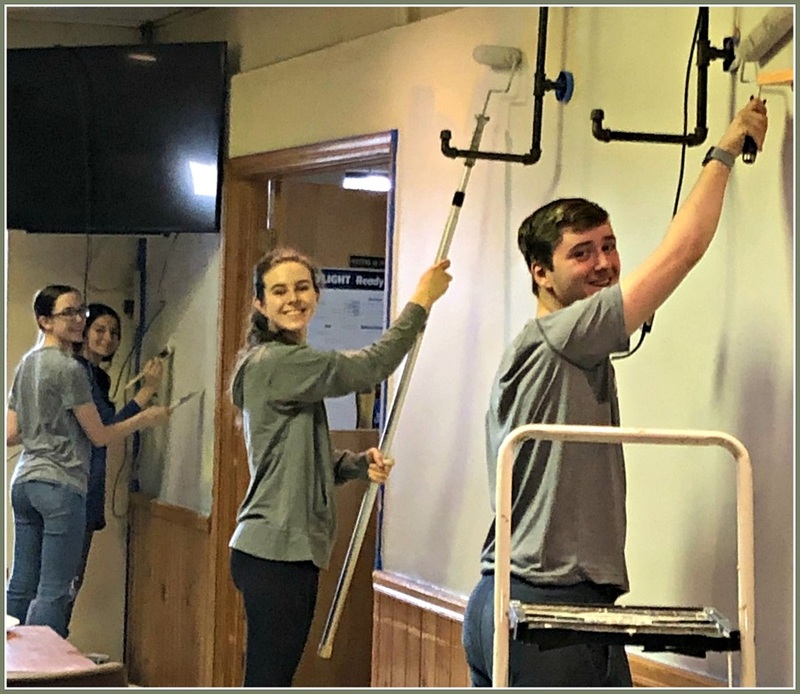 Staples High School National Honor Society members (from left) Sophie McCabe, Molly Fording, Kate Miller and Dylan Mace paint the VFW interior. The Riverside Avenue building now looks great. Dylan wants to get the word out, to make sure everyone in Westport knows about it. You don’t have to be a veteran to go! Community service is not all that Dylan does. He made 2nd team All-State and All-FCIAC for the Staples ice hockey team — and was the Wreckers’ MVP. “06880” — and the VFW, and the rest of Westport — salute Dylan, and Staples’ National Honor Society.